Description $1,000 below NADA Retail! Leather, Entertainment System, Third Row Seat, Hitch, Satellite Radio, Power Liftgate, Premium Sound System, Rear Air, Aluminum Wheels, 4x4, POPULAR EQUIPMENT GROUP, 5-SPEED AUTOMATIC TRANSMISSION AND MORE! Third Row Seat, Power Liftgate, Rear Air, Premium Sound System, Satellite Radio, iPod/MP3 Input. 4x4, Privacy Glass, Keyless Entry, Remote Trunk Release, Steering Wheel Controls. 28G LIMITED SIGNATURE SERIES CUSTOMER PREFERRED ORDER SELECTION PKG 5.7L V8 engine, 5-speed auto trans, 18" x 8.0" chrome clad aluminum wheels, MyGiG multimedia system, AM/FM stereo w/CD/DVD/MP3 player, radio hard disc drive, two-tone heated leather seats, two-tone leather-wrapped steering wheel, pwr sunroof, luxury front & rear floor mats, REAR SEAT VIDEO SYSTEM, 5.7L V8 ENGINE, MYGIG MULTIMEDIA SYSTEM AM/FM stereo w/CD/DVD/MP3 player, hard disc drive, Parkview rear back-up camera, TRAILER TOW GROUP 3.92 axle ratio, 7 & 4 pin wiring harness, aux transmission oil cooler, HD engine cooling, class IV receiver hitch, pwr steering cooler, POPULAR EQUIPMENT GROUP accent color running boards, pwr adjustable pedals, remote start system, 5-SPEED AUTOMATIC TRANSMISSION (STD), 18" X 8.0" ALUMINUM WHEELS (STD). Chrysler Limited with Light Sandstone Metallic exterior and Light Graystone interior features a 8 Cylinder Engine with 345 HP at 5400 RPM*. 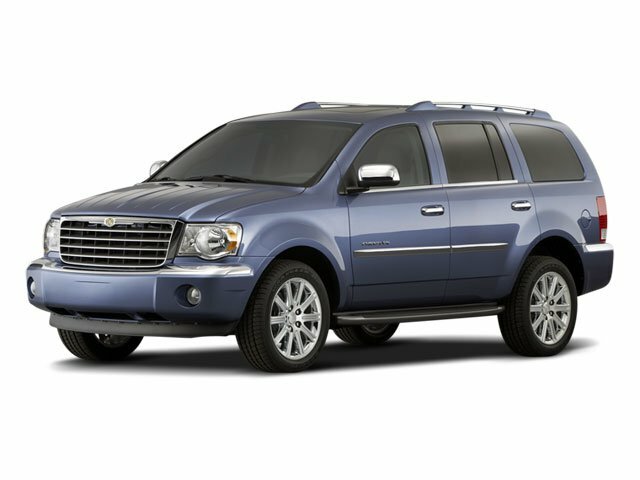 newCarTestDrive.com explains "The Chrysler Aspen is a big, traditional sport utility vehicle capable of towing substantial loads.". 5 Star Driver Front Crash Rating. 5 Star Passenger Front Crash Rating. This Aspen is priced $1,000 below NADA Retail.